If Easter were prolonged to Pentecost, you would not go to Confession until Pentecost, or if the latter did not come around for ten years, you would go to Confession only every ten years. 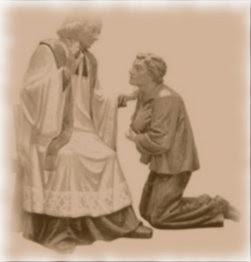 Indeed, if the Church did not give you a commandment about it, you would not go to Confession until death. What do you think of that, my dear brethren? Does it not mean that you have neither regret for having offended God, Who requires you to go to Confession, nor love for God, Who requires you to make your Easter Communion? Ah you will say to me, that's all very well. We do not make our Easter duty without knowing why. No, my dear brethren, I do not wish to talk to you today about those unfortunate people who tell only half their sins through fear of not making their Easter duty or of being refused Absolution -- perhaps even for the sake of covering up their shameful lives with the veil of virtue and who, in this state, approach the altar and are going to complete their dreadful work by handing over their God to the Devil and precipitating their sacrilegious souls into Hell.